This is one of my "Blast from the Past" recipes. I used to make it a lot when I was working. It's so simple and easy to prepare. Perfect for a busy weeknight! Spread 3/4 cup of the pizza sauce in baking dish. 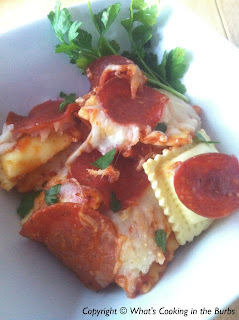 Arrange half of the ravioli in single layer over sauce; top with half of the pizza sauce and 1/2 cup of the mozzarella cheese, and half of the pepperoni. Repeat layers once, starting with ravioli. Sprinkle with Parmesan cheese and red pepper flakes. Cover with aluminum foil and bake 15 minutes. Remove foil and add remaining cheese and pepperoni. Return to oven and continue to bake uncovered 10 minutes longer or until bubbly and hot in center. Let stand 10 minutes before cutting. Enjoy! NOTE-If using frozen ravioli increase your cooking time by 20 minutes. OOOH! I love ravioli and pizza. This has to be awesome! I host a weekly link party that runs Sunday through Thursday. I'd love to have you join! Your Ravioli looks awesome! Thank you so much for sharing your great recipe with Full Plate Thursday. Hope you have a great week and come back soon! Oh YUM! The family would love this! Thanks for sharing at Simple Supper Tuesday.